When a woman has equal economic rights and the power to make decisions, she can lift herself, her family and her community out of poverty and improve lives for the better. Globally, 1.2 billion people live in absolute poverty — most of them women and girls — but America has a chance to support women worldwide today. Investing in women's economic empowerment is crucial to ending global poverty, making America and our allies stronger and lifting barriers so women can reach their full potential. Send a message to your Member of Congress today and urge them to support the passage of the bipartisan Women’s Entrepreneurship and Empowerment Act of 2018 and prioritize women’s economic empowerment. I'm speaking up with CARE Action advocates nationwide to urge you to support the passage of the Women's Entrepreneurship and Empowerment Act of 2018 that prioritizes entrepreneurship and access to resources for women and helps eliminate barriers that limit women's opportunities worldwide. The impact of women's economic empowerment is far-reaching. By ensuring women have access to and control over economic resources, assets and opportunities, we can move significantly closer to the end of global poverty and the realization of equality between men and women, while bringing about lasting change in social norms that benefit entire societies. When women can lead lives free from violence -- both in the workplace and elsewhere -- and access education and health care, they are healthier, more skilled and more ready to participate in economic endeavors. The United States has long supported women's economic advancement, but our voice must empower women worldwide to access economic skills, resources and rights. 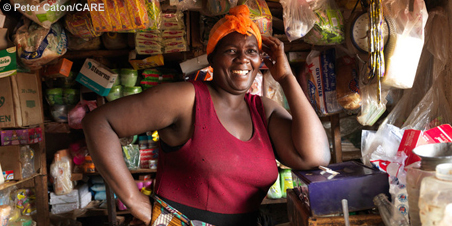 U.S. support for programs like CARE's Village Savings and Loan Associations (VSLAs) has helped 5 million members -- nearly 80 percent of whom are women -- across 46 countries achieve financial security and strengthen their household relationships. And these programs work -- 85 percent of VSLA groups are still operating five years after CARE's exit. At the same time, the world is witnessing the worst humanitarian crises we've seen since World War II, and 1.2 billion people globally live in absolute poverty. Now more than ever, we should be harnessing the potential of women everywhere and their roles in the economy, because this approach is proven to work. CARE prioritizes empowering marginalized women and girls living in poverty who have limited economic resources, and I hope you will, too. Let's take a stand together. Please support the Women's Entrepreneurship and Empowerment Act of 2018 and invest in women and the world today. 1. Question - Not Required - Enter the characters in the image exactly as you see them.